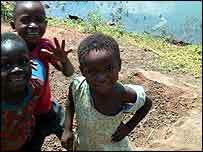 Every time children play in the dusty streets of the small Zambian town of Kabwe, they are putting their health at risk, according to environmentalists. What sets Kabwe apart from other places is the extent of its lead pollution, a grim, but for years hidden, legacy of the town's now disused lead mine. In its heyday, Kabwe boasted one of the largest and richest lead mines in Africa. But from the time the mine opened in 1902 and closed in 1994, there were few pollution controls and as a consequence Kabwe's vegetation, soil and water are heavily contaminated with the highly poisonous metal, lead. When breathed in, lead quickly poisons the bloodstream and attacks the central nervous system. Poisoning results in anaemia, vomiting, kidney damage and slows down mental development, especially in children. In severe cases, there is brain damage and death. For years the people of Kabwe were kept in the dark about the environmental mess in which they live and the health problems they suffered. According to environmentalists one of Kabwe's lead hotspots is Katondo, one of the townships that sprouted up in the shadow of Kabwe's old mine - which lies in the heart of the town. 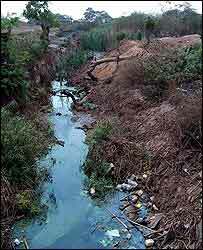 Katondo lies right beside a canal used to carry toxic waste from the pit. When the health people came here, they found that each and every child was poisoned by lead. 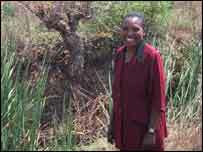 Kay-Valentine Musakanya runs the Kabwe Environmental Rehabilitation Foundation, a group that has trying to do something about Kabwe's lead problem. He claims that half of the hundreds of children living and playing in the dust of Katondo have tested positive for varying degrees of lead poisoning. "Children should not be playing in soil and dust that contain levels of lead higher than 400 parts per million. But here in Katondo, tests have shown that levels are as high as 10,000 parts per million. Lead is a neuro-toxin and at such levels, it is excessively dangerous for people's health, especially for children." Purity Mwanza is the mother of six-year-old Mary, who, like other children, often gets ill after playing in Katondo's dust. They live right beside the canal. Mrs Mwanza explains what has happened to her daughter. "When the health people came here, they found that each and every child was poisoned by lead. "The health people at one time treated them all with tablets and instructed us to wash the children three times a day to get rid of the dust. But this was too much for us mothers. "One day my child was walking in the soil and her feet became blistered. She also got sores on her stomach and bad pains in her stomach because of the lead." Although environmentalists and the former state-owned company that ran the mine, ZCCM Investment Holdings, may still disagree over the true extent of the problem, no one anymore denies Kabwe's poisonous past. About US$15 million dollars has been set aside for Kabwe, which has been included in the broader Copperbelt Environment Project (CEP). The World Bank is providing much of the money for the CEP, the clean up of Zambia's heavily polluted mining towns, an operation which is expected to finally take up sometime next year. In the long-term, it is likely that Kabwe's mine dumps will need to be covered in vegetation or capped with concrete to prevent dust being blown across the town, and medical staff will need to be properly trained and equipped to deal with the Kabwe's lead pollution. In the meantime, small steps are being taken in Kabwe to begin the task of cleaning up. But this has not been without controversy. In September, ZCCM-IH wrote to the 2,000 Katondo residents telling them to leave their canal-side homes for good so that the company could dredge the clogged up waterway after years of neglecting to do so. ZCCM-IH was concerned to prevent a re-run of last year's rainy season, when the canal flooded, and several years' worth of toxic waste, silt and rubbish was dumped onto the bank side, people's back gardens and even into their homes. But without places to go to or money no-one wanted to move. Last week, ZCCM-IH backed down. It will still dredge the canal, promising to remove the toxic material to a safe plan and provide contractors with safety clothing including masks. But it has abandoned its plans to move people. ZCCM-IH environment manager James Kalumbe told me that the company now realises that moving people out of their homes without offering proper alternatives or compensation was an oversight. Sadly, as Kalumbe himself admitted, the climbdown may be due more to the behind-the-scenes disapproval of the World Bank, which is paying for the Kabwe clean-up, than to the power of the people. Nevertheless, this is an important triumph for the residents of Kabwe, who for close to 100 years may have died by the thousands as a result of the cover-up of what environmentalists claim is one of the world's worst cases of lead contamination.